In today’s gaming world we so often think of AAA graphics, highly efficient enemy AI, superbly programmed physics engines and so on. Most strategy games usually forgo the typical trends and create a deep experience, while still presenting you with the latest graphics in the genre to date. It is refreshing then to see a game that is both addicting as well as straining strategically as SpaceCom. Currently in BETA on Steam, SpaceCom is a Space Strategy game where you take control of a fleet as you quell your rivals in nearby star systems. The game pits you as the Commander of your Battle Fleets to either invade or destroy nearby systems. 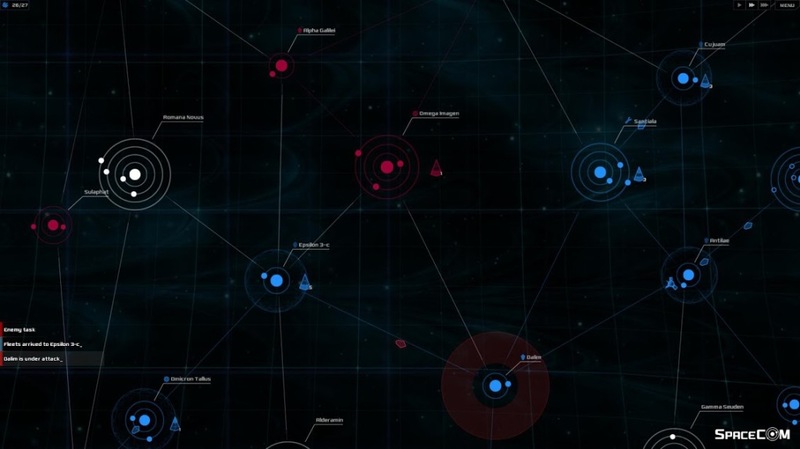 The game is portrayed in a top down full map view, making you feel as though you are in a command room watching the drama unfold. SpaceCom gives the player the opportunity to command encounters from the Captain’s chair. 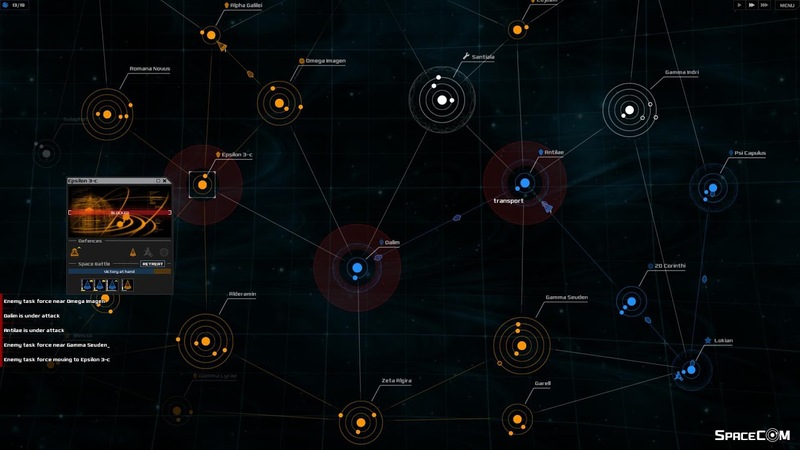 The game has you control three different types of Fleets: Battle, Siege and Invasion. Battle are, as you’d expect, the most adept at destroying enemy fleets. Siege destroy star systems making it so nobody can inhabit them. Invasion fleets allow you to take over a neutral system or steal a system from your enemy. While your Fleets are out doing your orders, the game allows you to build up defenses so you don’t have the need to keep fleets in your home base if you don’t want to do so. Battle Station and Shield upgrades provide some defense from enemies if they attack one of your systems. The last line of defense against a hostile take over are your ground troops, which fight off the enemy invasion forces. In terms of strategy games go, this game is not so in depth that you need to spend hours upon hours setting up and implementing your plan. An average match, for me at least, lasts about 30 to 40 minutes. Throughout each match the goal is to either invade or destroy your enemy’s home system. As you move throughout the map, you will need to take over systems that provide resources to your other systems. Some systems also house repair facilities so you can regroup before you launch your next assault. Finally, some systems provide the ability to build new fleets to replenish those lost in combat, or to simply bolster your current forces. Not all the maps or missions were available to try, as this is a BETA, but from what was available it was enough to get me hooked. Games like this prove that as long as you have a great gameplay concept, tight mechanics and compelling elements, graphics can truly be secondary. Not once was I put off because there were no pretty 3D models to look at. I was put off when I didn’t successfully defend a section of the map I previously conquered and was facing the threat of my enemy forging a path deep into my home systems. The game is unforgiving as well. If you’re not quick to realize a poorly made defense in your lines, or maybe you forgot that your fleets take attrition when in enemy systems, you could set yourself back considerably. I’ve launched offensives in multiple directions only to become too focused on one section and realize I’ve lost whole invasion fleets due to attrition. I’ve also lost fleets because I decided to cut off and reroute enemy resources and then simply forgot I was there. The game is slated to launch on Steam later this month. When it does, expect there to be discounts if you buy multiple copies as the game is very multiplayer heavy (50% discount when you buy two copies; buy three or more and get one free in some stores). In addition, for those in the BETA now, or are planning on picking up the game, developer 11 Bit Launchpad is hosting tournaments to win some great gaming gear. Head to their website for more information on the dates and prize packs. SpaceCom will launch on September 17th for PC, MAC and Linux on multiple Digital Distribution platform for $14.99. Previous One Vikings Saga to Rule Them All!